Today I’m thrilled to have Lisa Gail Green, one of our followers, here to share about her debut book DJINN: THE BINDING STONE, which is being released this month. I really love the idea of this story—a djinn trapped in an adolescent girl’s body and of the binding stone. That’s so original. And I loved the story and learning about Leela’s life now and 1000 years in the past. Lisa did an amazing job with the flashbacks and the pacing of the story. There was constant action and new problems to solve. Tricked into slavery by the man she loved, the Djinni Leela has an eternity to regret her choices. Awakened in the prison of her adolescent body, she finds a new master in possession of the opal that binds her. But seventeen-year-old Jered is unlike any she’s seen. His kindness makes Leela yearn to trust again, to allow herself a glimmer of hope. Could Jered be strong enough to free her from the curse of the Binding Stone? Hi Lisa. Thanks so much for joining us. Thanks so much for having me! I’ve been writing since I was seven, but didn’t treat it like a “real” job until about four years ago. Since then I joined SCBWI, learned as much as humanly possible, reached out with social media, and staked a few vampires. Just seeing if you guys are really reading! LOL. I also have three kids, a parrot and a husband who is a rocket scientist. 2. Awesome that you’ve been writing since you were a kid. How did you come up with the idea for your story? I was browsing the monstropedia site online because at that point I had a demon’s voice begging to be written and I knew they were overdone. I found the Djinn and saw that the original lore believed that they were similar (or could be) to mischievous demons and became intrigued. Pretty early in my research the story began taking shape in my head. It’s changed a lot since then, but Leela was always my MC. 3. I read that you drafted the first draft of this story in a few months but that it took years to revise it. That’s the same process for me with my first manuscript. What did you learn from the process? What didn’t I learn? :D I get so much out of each new manuscript – and I have quite a few but won’t scare you with a number. I’d say this one has taught me several major lessons including a better understanding of world building, the benefits of killing your darlings, and the importance of many revisions. I feel like each one adds layers to the book. Even when you take things away, you are actually adding to the power of the words you leave behind. 4. Okay, I won’t embarrass you with the number of revisions my manuscript has gone through either. I so agree that you learn so much from each revision. Share about your main character Leela and your process of developing her as a character. thinks she’s so in control of her emotions, but she isn’t. In the book we meet two Leelas. One from a thousand years ago who learns a very hard lesson and faces some pretty awful stuff, and one from current times who is jaded but yearning for love and freedom. Developing her character? I was an actress, so I use that and it’s probably why I gravitate toward first person. I become the character when I write, which is so much fun. So I basically climbed in her head – or she got in mine IDK which! I recall toward the end there’s this one part that took both of us by surprise. I cried and had to stop, considering whether to change it, but realized that was how it had to go. If it hadn’t taken her by surprise, it couldn’t have happened. How’s that for a teaser? I think the biggest challenge in revisions with Leela’s character was her thoughts on romance and love. Her physical feelings were getting mixed up with her emotions and I had to have that moment when she realizes that love is so much more than the physical. That was a big change for her character and very important to the story and the overarching series. 5. I wanted to cry for Leela on occasion while I read this. It must help with the character development that you were an actress. What was one of the challenges you faced in writing THE BINDING STONE and how did you overcome it? My nemesis – world building. My initial drafts tend to be sparse and get filled in later. I really had to concentrate on how to intersperse interaction with the world around Leela into the story so that it would enhance what was happening. I love writing dialogue, but that isn’t enough! There has to be balance. I wish I could tell you there was a magical cure, but it was just a lot of going over and over the book. 6. Yes, world building and setting are the hardest things for me too and what I like the least about writing. I know THE BINDING STONE is part of a series. Did you outline out or have a general idea of where your story will go in future books as you wrote/revised this book? Do you have any tips on how aspiring authors should handle writing a series as they look at the first book being published? Great question! I’m typically a pantser and yes, I wrote this one by the seat of my pants initially. But I do have a good idea where it’s going and what has to happen. I knew right away that each book would be the POV of a different Djinni. The next one is in Taj’s perspective, which is unbelievably fun to write. Here’s the thing – I personally dislike when authors use a book as only part of a story. No huge cliffhangers for me – especially in middle books. I believe firmly in one story arc per book. Yes there needs to be an overarching story, but it should be as invisible as possible at first. Think HP. Perfect series. Exactly as long as it had to be and each one had its own story with a satisfying ending, yet we still couldn’t wait for the next. Yeah, I know, I’m not comparing myself to JK!! Just showing why she’s the master. 7. I loved Taj! Awesome that he’ll be the main character in book 2. I’d like to move onto the business aspect of publishing. Your publisher is Fuzzbom Publishing. Share how they became your publisher and what you considered in deciding to go with a small, newer press. Do you have any advice for the rest of us considering signing with a small press? I LOVE FUZZBOM. What happened was this. The book was shopped with about 15 editors. It was complimented a lot, but ultimately not sold. I had/have other projects and even a revision request on this book from an amazing editor at a great house (from a conference I attended). In the meantime I participated in the Journeys of Wonder anthologies put out by Fuzzbom as their initial publishing exercise. Well, the stories I wrote for that were more successful (in my own estimation since that varies on your definition) than any of my traditionally published works. Meanwhile my editor there, Ian, who had actually been an initial beta reader on the book kept hinting that he’d love to help me publish it when I was ready. See, it’s their first novel too! So we are taking a chance on each other. But I have to tell you, they are so professional and really have a handle on the market. It’s incredible. The editing I received was exceptionally thorough and inspiring. The copy editing was first class. The cover was done by my favorite cover artist – shout out to Lisa Amowitz! And I had my hand in everything. It was like getting the best of both worlds. I loved the experience and look forward to some more work with them in the future. And yes, I’m hinting that there may be more than just this series. 8. So glad it’s worked out so well for you. What is Fuzzbom Publishing doing to help you market your book and how much of the marketing are you doing yourself? Like pretty much all authors today I am doing a lot of marketing, but Fuzzbom is definitely doing their part too! They are helping me explore Indie stores for the print book, searching out all-important reviewers, and so much more. I really don’t think I could do it all myself. We’re a team. 9. Great you’re a team with them. What social media platforms are you planning to use to spread the word about your book? Are you planning to focus on any one or two platforms more than others and why? Ooh… As you know I love my blog and Twitter!! So I will continue to use those, but I promise not to be one of those spammy type people that only says, “buy my book!” :D I also have a new author page on FB that could use some more likes. *bats eyes at readers* A Goodreads page for the book (and author pages for Goodreads and Amazon). Think I overdid it a bit? Oh and I should mention all the other blogs I’m on! The fabulous Scene13blog, the Enchanted Inkpot, and every month Martina Boone and I do the Firstfivepagesworkshop which is uber helpful (just ask the people that have signed with agents since participating). 10. Love The Enchanted Inkpot. (You can find the blog HERE and I recommend you all follow it if you like fantasy.) You just announced your publishing contract on January 1st and about 5 months later it’s being published. That’s a fast launch time. Is there anything that surprised you about the process of getting from signing your publishing contract to becoming a published author? Well, that’s a little deceptive. It’s definitely faster than most of the traditional pubs, but we’ve been hashing it all out for a bit before the announcement. The thing that surprises me? How fast time seems to move when you have a deadline looming! Writing is a lot of waiting for stuff to happen and then getting caught in a whirlwind when it does. :D But I wouldn’t trade it for the world. I work well under pressure. 11. What are you working on now? Besides the sequel and promotion? I always have things going. My critique partners tease me all the time. I have some new things brewing, but the next thing you will likely see is WINGING IT, which is close to my heart. It’s about Zach, a teenage boy who finds out he’s basically – well – a fairy godmother (or in this case a Destiny Fulfillment Support Liaison). It’s super fast paced, full of humor and action, and also full of heart. I love the cast of characters, but I think I might be in love with Zach. Shh. Don’t tell my husband! 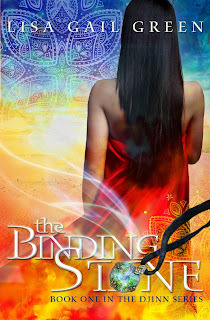 Lisa has generously offered an e-book of DJINN: THE BINDING STONE for a giveaway. To enter, all you need to do is be a follower (just click the follow button if you’re not a follower) and leave a comment by midnight on May 31st. I’ll announce the winner on June 3rd. Next Monday, I’m thrilled to have Kelley Armstrong here to discuss and give away an ARC of Loki’s Way that she co-wrote with Melissa Marr. It’s a fantastic upper middle grade fantasy story that fans of Percy Jackson will like. I really loved the mythology based on Norse gods and the characters. I can’t wait to read book 2 in the series. I met Kelley at a book signing in Ann Arbor a few years ago and she is the nicest person to her fans. I’m beyond thrilled to have her here. Next Wednesday I’m doing a post on how I set up author interviews and promote books the way I do. I had a request from a follower to share about this. And I’ll be doing a review and giveaway of REQUIEM by Lauren Oliver and another book by her. I really enjoyed reading from both Lena’s and Hana’s point of view and seeing how the series ended. The following Monday, I’m excited to interview debut author Natalie Whipple about her book, TRANSPARENT. It’s about Fiona, invisible to the world and herself, in a futurist world, desperately trying to carve out a normal life and escape her dad. I really enjoyed reading about her story and that of her friends who have unique powers too. Wednesday that week, I’m interviewing debut author Dorine White about her book, THE EMERALD RING. I really enjoyed learning about the powers of the emerald ring with Sara, a smart middle grader, and her friends. And I found the mythology based on Cleopatra to be unique. Wow, sounds like you've got some great stuff coming up. And I'm glad your doing the post on how you set up your interviews and book reviews, I was just wondering about that. Congrats on your book Lisa! I love the cover and how colorful it is and it sounds like a fun read. I love how you developed the idea for your story. I often start with one idea and it turns into something else entirely when the book is written. Sounds like a very cool premise! That covers looks amazing- Congrats! I usually don't read YA but this perked my interest. Just thrilled for Lisa! I love how she created a different POV with an old lore, using it as a twist. I'm also adoring her cover! Congrats, Lisa!! So fun to hear more of the story, Lisa! And how cool to be Fuzzbom's first novel!! I love stories about Djinn. I'll have to get this one. I love how you created a fresh twist for this story - and many more raves for your story in the comments here. Congrats! Lisa's book sounds wonderful! Thanks for sharing the interview, Natalie. I'm looking forward to next week's posts! Love the idea of the story. Delighted to hear about first five pages workshop. And I can't WAIT to read about Zach! Thank you all for the wonderful comments! Pen N. Ink - I'm glad to get more word out to people about the workshop. It's really an awesome experience. I've learned a LOT just critiquing. Sounds cool! An fresh! I'd love to read it. Loved hearing your journey! Can't wait to read this! I've had the honor and delight of reading The Binding Stone. It is a fantastic ride. Your heart is either racing or breaking, and there's a bit with a tent, and flames and...I'll stop now before I spoil it. I've worked with Fuzzbom on the Journeys of Wonder anthologies - they are a class act. Congrats, Lisa and Fuzzbom. Take the world by storm. I didn't realize Lisa A designed the cover. I'll never grow bored of seeing it. I struggle with world building too. Hence why I avoid writing any sort of fantasy. I had no idea there was a monstropedia site. I love the sound of this book and that cover is stunning. I hope to read Lisa's book. Great interview and sounds like a good book. I agree with the author's comment re world building. I think world building intimidates me and I marvel at how authors do it. It seems so complex and overwhelming to take on. Wow. I would read this book simply based on the breathtaking cover. This is so on my to-read list. Love the premise! I would love to read your book and I know my daughters would too. Thanks for sharing your insights and I will share this link on Facebook. My Kindle library shelf has a spot reserved for your book! Yes - world building is intimidating at first, but I really believe experiencing it through the characters is the key. I KNOW! I LOVE the cover!! It's perfect for the book. Lisa A. is amazing! I sincerely hope you enjoy the book! Please let me know! Congrats to Lisa! That's fantastic that it worked out well with her publisher! I LOVE all mythology, and it's really really nice to see non-classical myths being done more. The djinn are so much fun. :) And that cover is beautiful. Wonderful interviews and looking forward to checking out the book and....your blog! Lol on the number revisions. I hear ya both. Winging it. I love that name. I love how you say you climbed into her head and basically "become" her. that is exactly what I like to do while reading! Stalked a few vampires, eh? ;) Great interview! Great interview. Sounds like the kind of book I can't wait to get my hands on. Congratulations, Lisa! Like Leslie, I've also had the pleasure of reading this book. It was an earlier version, so I'm excited to read the published version. Lisa is an amazing storyteller, and I'm so glad everyone else will have the joy of reading her work! 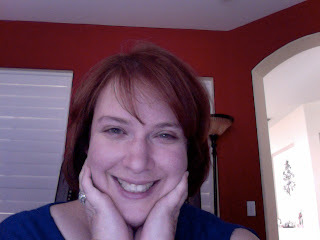 Hey everyone--Lisa A, cover designer for Lisa GG and a card carrying member of the Lisa Army . (we are on the march!) Thanks for the cover love--it is always a joy to design a cover for a book you actually enjoy reading!! So gobble it up--it's a fun, fun read! I devoured the Binding Stone and I'm so excited to hear Taj is the star of the next book in the series. It's going to be hard act to follow after Leela, but Taj definitely deserves a story of his own! Reading interviews like this is great because it reminds me that we all are a different kind of writer. Some write the first draft quickly then revise, revise, revise and others revise AS they write, etc. But no matter how we do it we are always learning more and what works for us and it's always a lot of work. This book sounds great! I'll have to remember to watch for it in the future! Just a note to let you know that the book is now available for Kindle! So exciting! The cover of this book looks awesome.